Dundee United have signed Slovakian goalkeeper Dusan Pernis on a pre-contract agreement. The 24-year-old is currently under contract with MSK Zilina until the end of December and United hope to negotiate an early release. But United say that, if this does not prove possible, manager Craig Levein intends to bring in another goalkeeper until the end of the year. United are seeking a new number one after Lukasz Zaluska moved to Celtic. 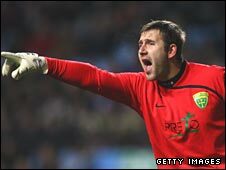 United have already recruited 37-year-old former Hearts goalkeeper Steve Banks as a player-coach this summer. He replaced veteran former Dunfermline goalkeeper Scott Thomson. Michael McGovern also departed the Scottish Premier League club, signing for Ross County, after failing to make the breakthrough at Tannadice after his arrival from Celtic. Zaluska, who was being presented to the media by Celtic on Monday, himself signed a pre-contract agreement in January to join the Glasgow club. The Poland international, who had two-year spell at Tannadice, thanked Levein for taking a chance on him and predicted continuing good times at Tannadice. "I would like to thank Dundee United and the coach and all the supporters, because it's thanks to them I am sitting here," who joined Celtic from Korona Kielce. "They gave me the opportunity to become successful in Scotland. "I think the Dundee United coach is that good. He loses good players every year, but he still manages to be successful."